Use Profitworks' search engine optimization and conversion optimization services to grow your business' revenue. Not sure what SEO (Search Engine Optimization) is? Click here to learn more. Return on investment is a measure of how profitable something is. It is a performance measure used to evaluate the efficiency of an investment or to compare the efficiency of a number of different investments. To calculate return on investment (ROI), the benefit or return (ie. profit) of an investment is divided by the cost of the investment; the result is expressed as a percentage or a ratio. "I've found Profitworks to be tenacious and adaptable to the challenges our industry posses"
Most marketing methods a are a pay once benefit once marketing method. For example you pay once to have an add in a newspaper and once your ad runs the benefit from that marketing spend ends. With search engine optimization it is a pay once, benefit indefinitely marketing method. That is that the benefit you receive from the search engine optimization you do today will benefit your business tomorrow, and the day after and the day after etc. Since SEO delivers this type of recurring benefit it continuously delivers additional sales for your business for that single amount of SEO work. If you are doing SEO work continuously on your website the recurring benefit compounds and grows each month. Since SEO is unlike most other marketing methods in this regard, it leads to a higher than average ROI. If you would like to get the power of SEO working for your business click here to book an appointment to discuss and see if our services would be a good fit for your business. Today 93% of purchases start with an internet search*. As such it is paramount that your website rank high in search engines for what search phrases buyers are searching. 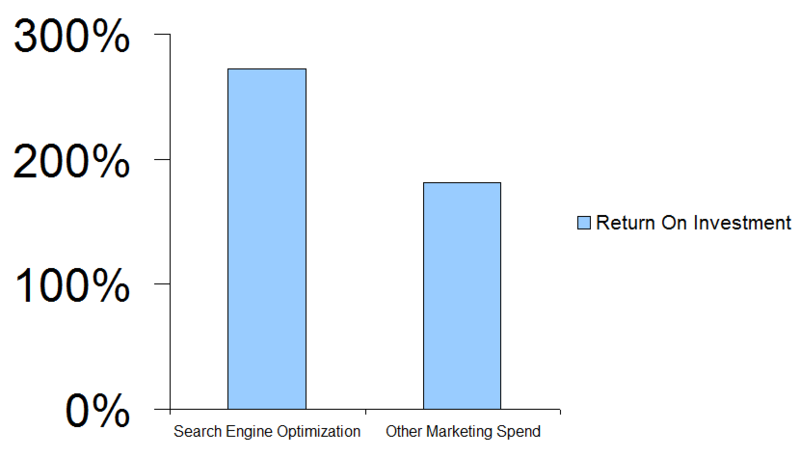 Given that search is where most people look to when they want to buy something it is no surprise that search engine optimization has a higher than average return on investment among marketing mediums. The average cost per marketing impression is over $8.00 for television, over $6.00 for magazines and over $4.00 for radio. The cost per impression for long term website optimization is usually under $2.00 per impression. Search engine optimization is a much lower cost medium to have your message presented to potential buyers. Since the cost to display your message to buyers is so much lower with search engine optimization it makes generating a higher return on investment much easier. To learn more about how SEO compares to other marketing methods book an appointment with us to discuss. The amount of things you can do on a website is almost endless. On a website you can display things visually with static images, you can show videos, you can make objects move, you can play music or other audio. Many marketing methods are limited to either static images (ie magazines, direct mail), sound (ie. radio) or video with no interaction (ie. TV). With a website you can do all of this and allow the prospective buyer to interact with your content. When interacting with the content the prospective buyer can select what topic or product they would like more information on, which is not the case in many other marketing methods. Since websites are so much more interactive than many other marketing methods it gives SEO a distinct advantage to delivering a higher ROI. With our service we employ very detailed tracking and analysis tools using the power of IP technology and the internet. These tools allow us to have much more accurate tracking tools to draw a direct connection between how the visitor found your website, what they did on your website and track the resulting sales impact from your website. Hands down search engine optimization provides the greatest amount of data, tracking and analysis tools of any marketing method, hands down. No more guessing as to the impact your marketing is having. With your tools we can show you exactly how much it has increased sales. If you would like to learn more about how we can implement these tools and processes for your website, contact us today. If you don't fully understand what we do or what the definitions are of some of the terms we have referenced on this page that is okay. We would be happy to discuss with you, explain things further and educate you a little bit about the basics of search engine optimization. You can also learn the basics of search engine optimization by clicking here. If you prefer to talk to someone rather than read give us a call to learn more about search engine optimization and how it works. We are always open to discussing with people to help them understand SEO. If you are not interested in our services but you would like to grow your customer base we also provide free marketing and sales tips. To receive these free insights as they are published enter your email in the box below.